More than any other Florida politician, Senator Marco Rubio has made himself the face of opposition to the Affordable Care Act (aka Obamacare—yes, they are the same thing). Alas for him, he had to do this by playing second fiddle in Texas senator Ted Cruz’s grandstanding not-exactly-filibuster just before the Republicans shut down the federal government. There was Rubio playing the friendly face-licking Labrador to Cruz’s droopy-eyed alpha-dog bloodhound—a mere sidekick to the firebrand who has replaced him as the GOP’s Rising Star and Great Latino Hope. The irony! No less an irony was the fact that the two states they represent—Texas and Florida—have the highest percentage of residents without health insurance in the country, and the Latino demographic they pretend to represent are the least covered of all. 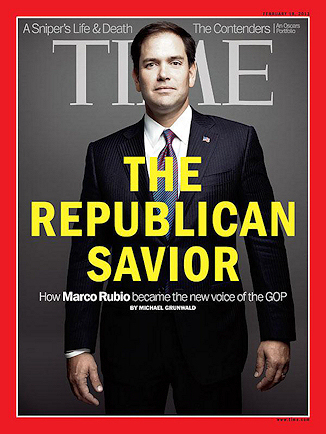 It seems only yesterday that Rubio was being touted as a possible running mate for Mitt Romney, and—after Romney went down hard in November—was featured on the cover of Time as the GOP’s “savior” and likely next presidential candidate. Equally important, he has a soothing Reaganesque knack for convincing the very people his policies would screw over that they really should support him. You know—social security was fine for our deserving parents, but we really shouldn’t expect to have anything like that. He doesn’t yell, he lulls, and if you don’t pay attention to the actual words he’s saying, it all sounds kind of reasonable, especially coming out of that adorable face. Rubio adopted all the correct views to make himself the darling of Florida’s Republican right-wing and caught the 2010 Tea Party wave that swept him into the Senate. But he really had no particular accomplishments to show except for getting elected. In an effort to remedy that—and to try to address the GOP’s dismal standing with Latino voters (other than Cuban-Americans)—Rubio became one of the Gang of Eight senators from both parties tasked with drafting a comprehensive immigration reform bill. He even came around to backing a path to citizenship for undocumented immigrants, and he quickly emerged as the Republican spokesman for the bill—upstaging senior GOP senators like John McCain. Lo and behold, in June the bill was approved by the full Senate, though Rubio’s new BFF Ted Cruz voted against it (as did the other insurgent Republican princeling, Rand Paul). Once it was sent to the House, however, the Republican caucus—dominated by the Tea Party Taliban—hated the legislation, and it has languished ever since. Rubio’s star began to wane with the party’s right wing as Cruz’s rose in the heavens, and Rubio quietly moved to the background on immigration reform. 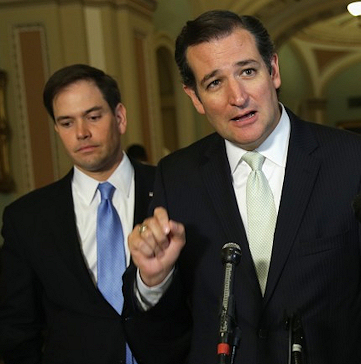 Which brings us to his role in Cruz’s sorta-kinda-filibuster. To be fair, Rubio has always opposed the ACA, but it’s hard to see his eagerness to act as Cruz’s wingman as anything other than an attempt to re-ingratiate himself with the Tea Party that put him in office in the first place. Rubio’s polling numbers are now in negative territory—a big fall since a year ago when he was riding high. It’s certainly too soon to count him out, however. He has another three years of his senate term—plenty of time to decide whether he’ll run for reelection or another office. It’s also hard to predict how his recent wriggling will play out with voters, and whether popular blame for the shutdown—which seems to be falling heaviest on Republicans (and rightly so)—will fall on Rubio as well. In 2011, he voted against raising the debt ceiling. If the Republicans do precipitate a catastrophic fiscal crisis by failing to raise the debt ceiling this month, Rubio has clearly put himself among the crowd that will have caused the disaster. The republican party is done.. the leaders know it too. They are willing to try anything crazy or sane now.